Last year when I booked flights to Japan for May/June, I made a promise to myself at the beginning of this year that I would spend the months in the lead up to my trip learning the language – I bought the Lonely Planet Japanese phrasebook and CD, I downloaded various Japanese dictionaries and learning apps on my phone. I did all the things to commit myself to learning Japanese, but it was a promise that I broke. My excuse was I became too busy with organising a food truck festival! 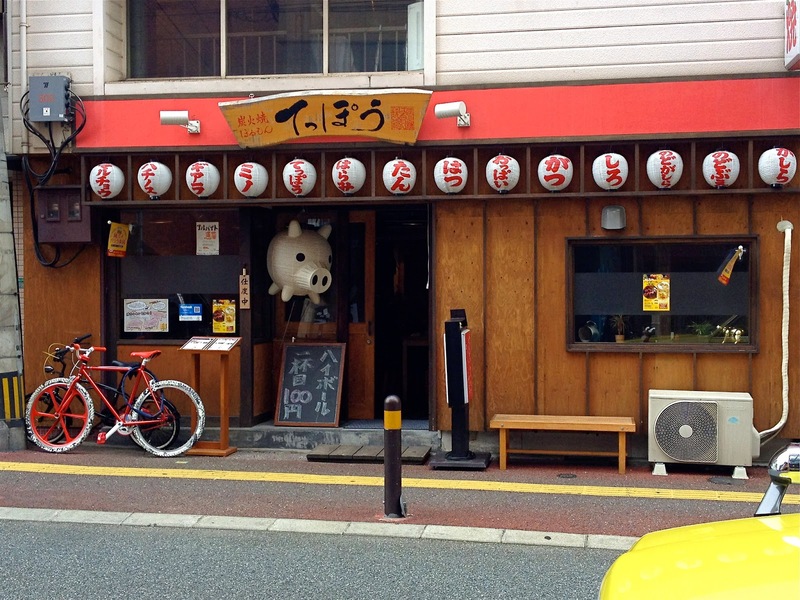 As I travelled around Japan, communications at times were difficult but my ignorance of the language also led to some memorable dining experiences. 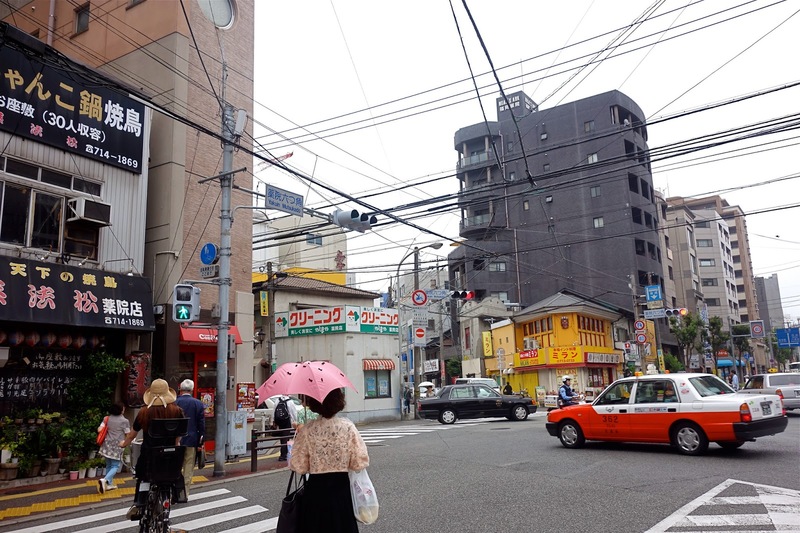 I was after more traditional style Japanese accommodation during my travels so in Tokyo I stayed in Ikebukuro at Family Inn Saiko, which I found through searching on booking.com. It was a ryokan that had lots of great reviews and I could not fault my experience of staying at Family Inn Saiko. It was my favourite accommodation throughout my trip where I travelled all over Japan and stayed at six other places. What made Family Inn Saiko particularly good was its location in a more residential area which was a 10-15 minute walk to the nearest train station and it gave me a real feel for how the Japanese lived while I walked through the neighbourhood. The people who run Family Inn Saiko are also really friendly and thoughtful, providing an abundance of information, maps and guides for travellers. They even told you the weather for the day and would remind you to carry a jumper if it was going to be cold. Aptly named Family Inn, they made you feel like family. 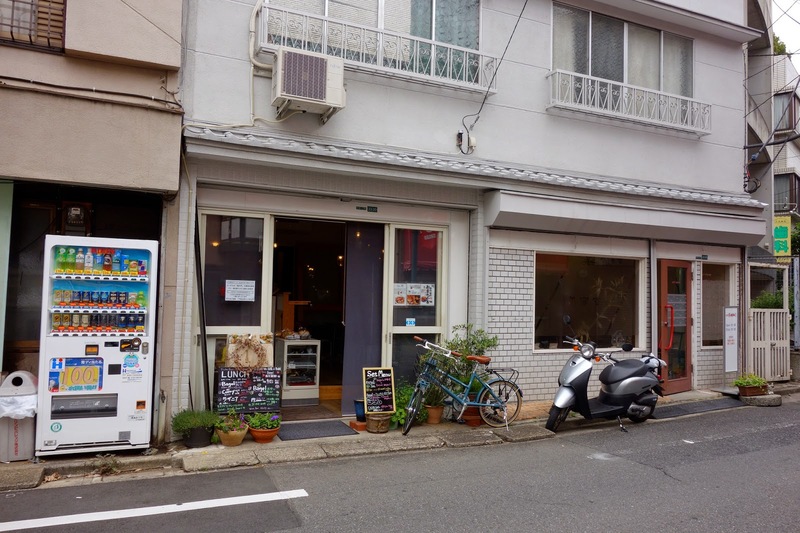 In the mornings I usually grabbed an onigiri from the 7-11 convenience store on my way to the train station, but one day I stopped at a little café which was along the way. It caught my attention as I saw a newspaper article stuck on the front window with a photo of the owner and bagels. I couldn’t read it as it was in Japanese, but I assumed the article was about how amazing the bagels were at this place so I knew I had to try one. The café was small, seating only 8-10 people and was run by a sweet middle aged woman who looked like she probably lived upstairs. I pointed to a bagel in the glass cabinet and said “one please”, then I tried to communicate in broken English “filling? what can I have in the bagel?”. She rattled off in Japanese with various hand gestures and I couldn't understand her at all, so I just said yes to everything – “yes, yes, yes, I’ll have it”. I sat down at a table while she prepared my bagel and about 15 minutes later she presented me with this dish! Holy *?#%&@! I thought I just ordered a bagel but what I actually got was – toasted plain bagel sliced in half and buttered, a dollop of egg mixed with mayonnaise with a sprinkling of curry powder, some cream cheese, some tuna, two small pieces of bacon, salad with dressing, small slice of frittata and a small bowl of pasta topped with Japanese curry sauce and cheese (!!!). So I got the Bagel Breakfast of Champions. It beats any breakfast with the lot that I’ve ever had! BUT that wasn’t it, after I finished my plate, it was taken away and I was presented with this! Dessert! What?! I did not expect this. Did I say “yes” to this too? 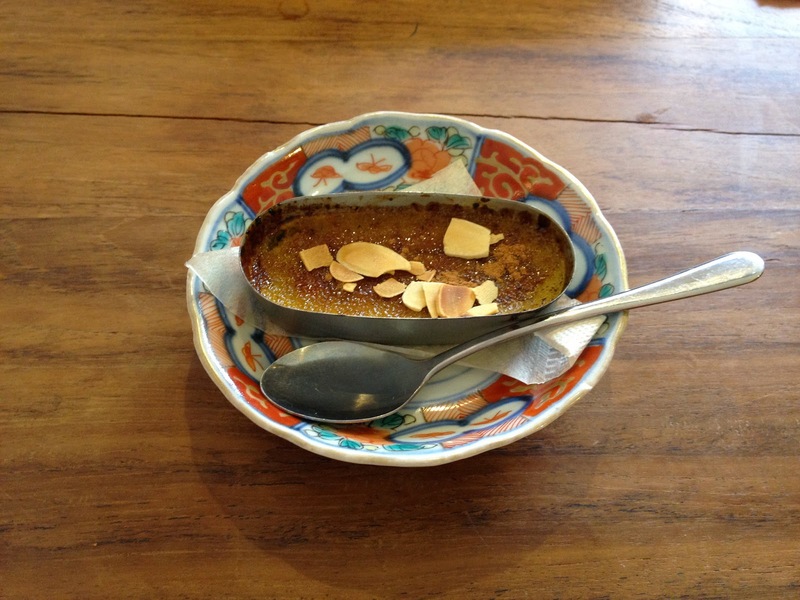 An almond flavoured crème brulee which cracked as my spoon hit it. Yes! What a way to finish the Bagel Breakfast of Champions! It cost me 1080 yen for the Bagel Breakfast of Champions, dessert and a glass of grapefruit juice which is about $12-13 in Australian dollars. As I paid, I said “good” and gave the lady the thumbs up as it was the only sign language I knew to show her how great her food was and she understood that I loved her food. She looked really happy that someone (a foreigner) enjoyed her food but I hoped she realised she made me even happier that day. What a find and what an experience not speaking/understanding any Japanese got me for breakfast! This is the Bagel Cafe! 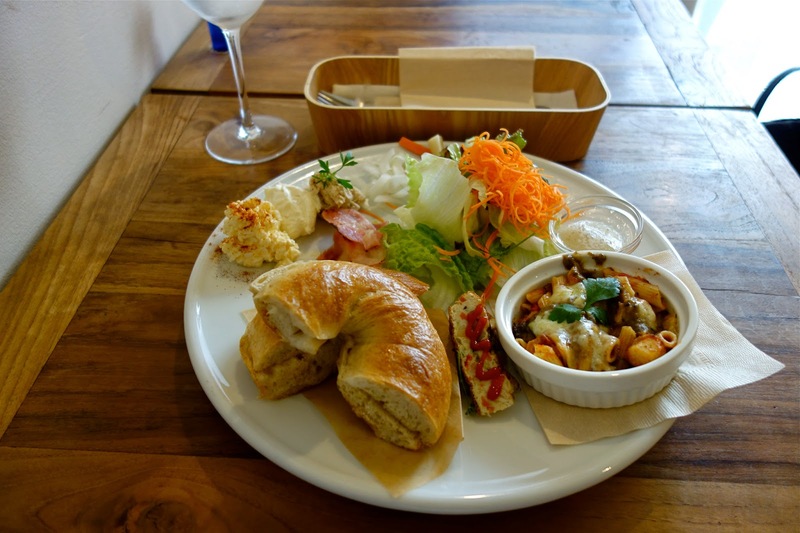 The cafe is somewhere along the route to the Kanamecho Station from Family Inn Saiko as I have indicated with a star on the map below. 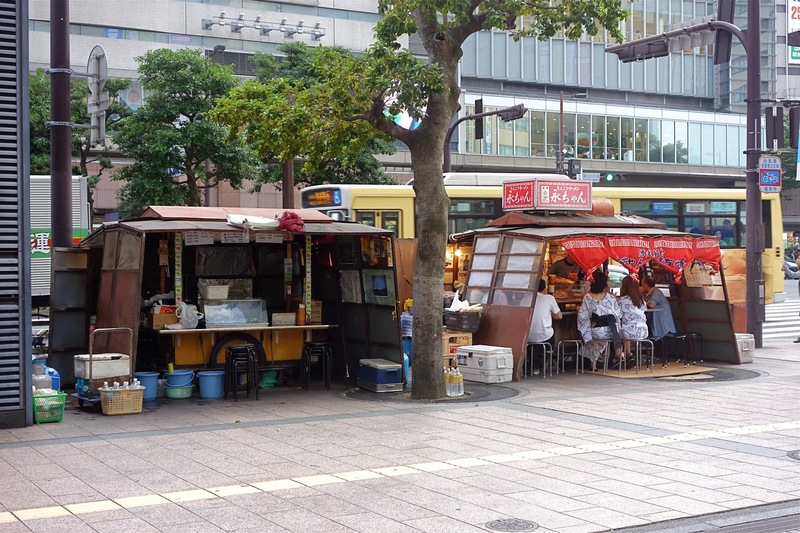 Fukuoka is known for yakitori (grilled chicken) and my first experience of it was at a yatai, a mobile ‘shop stand’ that is set up on the roadside in the early evening and then removed late at night or in the early morning hours. 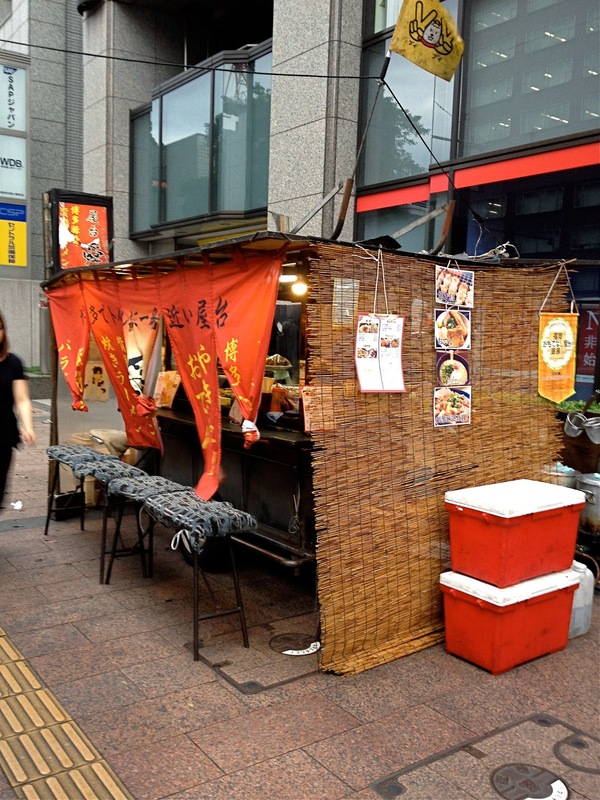 I loved the experience of eating in this unique open air intimate environment as yatai’s seat about 8-10 people and watching the chef work in his tiny kitchen. 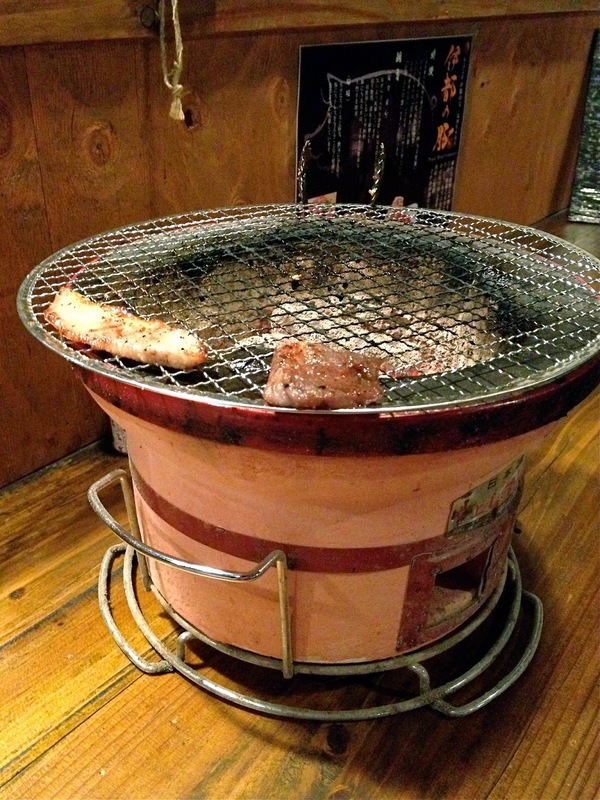 On my second last night in Fukuoka, I went looking for Yakitori Hachibei in Shoninbashi. Yakitori Hachibei is famous for its yakitori, so much so, that it has opened up branches in Tokyo and you’ll find it topping lists for best yakitori. 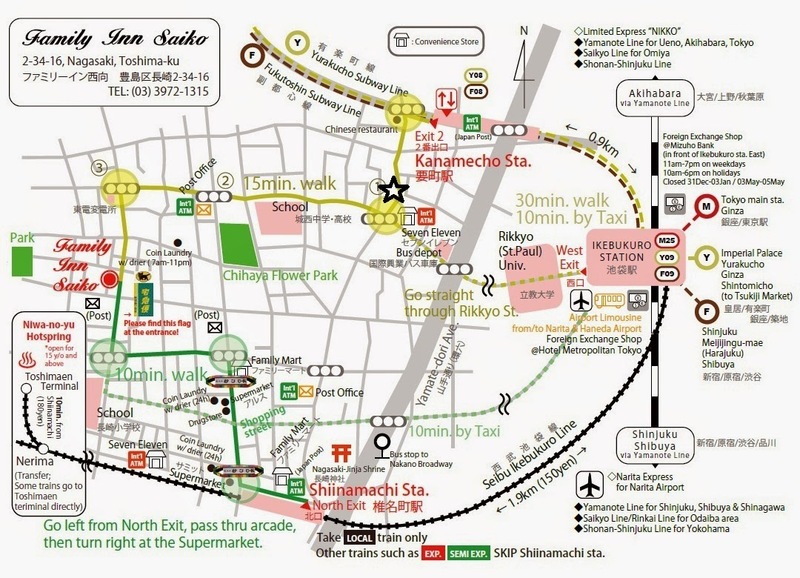 But I had no luck finding Hachibei, even after asking for directions from two convenience stores where I was given directions in Japanese and drawn a map which I tried to decipher. So I gave up and settled on a joint that was busy, it had all the right smells and I liked the vibe of the place, sometimes you just have to go with your gut feeling. As I sat down I realised it was actually a yakiton place (aka grilled pork) rather than yakitori. Japanese only menu, there were about 15 different parts of the pork you could order to grill, so I randomly pointed to some numbers on the menu for the waiter to take down. There were pictures of raw sliced pork on the menu - a helpful guide I suppose if you could also read the menu, but it was just all different shades of red and pink to me. I ordered 4 different kinds of pork (fingers crossed I had ordered right and got normal cuts?! ), plus some fatty well marbled beef and soup. The chef came out of the kitchen with my order and tried to communicate something to me….the waiter takes out his phone and using a Japanese-English translator, the words “very large” appear on his screen. So I assumed they were telling me I had ordered too much food, but I told them it was “ok”. Maybe they weren’t too convinced but the customer is always right, right? It was also quite late, about 9ish as I had spent a significant proportion of the evening earlier trying to find the other place (Hachibei) so I was quite ravenous! My plates of marinated pork came out, and for each plate the chef pointed to a part of his body to indicate what part of the pig it was. I’m not sure if this was normal practice but maybe they wanted to be sure I knew what I had ordered? I sensed a bit of hesitation…uncertainty… and I understood why when I found out I ordered, cheek, neck, heart and liver …. wtf did I order…hmm they weren’t exactly my choice cuts of pork but I had my game face on and acted like I was totally down with it. The meat did not come out skewered but as individual bite sized pieces marinated in a shallow plate and you had your own charcoal grill at your table to cook the meat. I had another wtf moment as I wasn’t sure how I would cook my meat. I didn’t want to ruin it by overcooking or undercooking, especially the heart and liver, I had no idea what to do with those (!). As if they sensed this, a waiter would stop by my table every now and then, and watch over my charcoal grill, checking how the meat was cooking, turning it over and indicating to me when it was ready to eat. It was a very thoughtful gesture and I was grateful for it. So I ate my pork cheek, neck, heart and liver. The cheek and neck were great, well they were the most normal cuts of pork chosen. The heart was surprisingly better than what I’d imagined it would be and I had no problems consuming it, but after a few pieces of liver it was a bit of a struggle. Liver, it just can’t hide the fact that it’s liver! The only way I like eating liver in as velvety smooth pate where the flavour is masked by a lot of fat and flavoured by herbs and booze. Yakiton style, the liver was not dressed up and had that metallic gamey taste and soft, spongy texture I could not shake off. So to deal with this liver, I asked for more pickles. The Japanese have pickles with every meal and not only are they delicious, but they help to cleanse the palate and enliven it, especially when one is chowing down on liver. I also downed a lot of beer to help the liver journey down to my belly. Trying all these parts of the pig, made me really appreciate the simplicity and beauty of yakiton. To the credit of the chef, everything was wonderfully marinated and seasoned. It was an open kitchen so I could see that the meat was freshly marinated as each order came through, each part of the pig was marinated differently to bring out its best. So I enjoyed the heart and liver (well the liver to a certain degree) because it had been marinated and cooked so well. At other tables I saw people getting served a large plate in the shape of a pig, divided into the different parts of the pig with each section containing a few pieces of pork. These appeared to be the special order that the restaurant was probably best known for. You could grill and eat every single part of the pig! This photo is of my last two pieces of meat. I’m pretty sure they didn’t think I would make it through and eat all the meat I had ordered, and to be honest I was struggling a bit towards the end. I probably ordered enough food for two or more people which is why they questioned me about the amount I had ordered at the beginning. I could sense that they were impressed that I finished everything, and I was impressed with myself! If I wasn’t so ignorant (ie: knew how to speak Japanese), I would have probably just ordered the pork belly (I’m a sucker for it) and less meat, but then my experience would not be as enriching, and I wouldn’t have learnt about what makes yakiton good and gain an appreciation for parts of the pig I wouldn’t generally eat. Yakiton is grilled meat but it’s the porcine unmentionables where it shines and shows what a simple marinade and grill can do to some awful (offal!) meat. At the end of my meal I think the chef was trying to ask me how I was, I got out my phone and using an English-Japanese translator I type “full”. He laughs and tries to type something back on his phone to me but before he finished, I had shared another message on my phone to him. I typed “very good”. It was as if I had read his mind, as he turned his phone to me and was going to ask “how did it taste?”. He said “me happy”. I made him happy as I enjoyed his food. And I really did enjoy it - pork parts roulette is fun! I walked past the yakiton place the day after and here's a photo of the front. 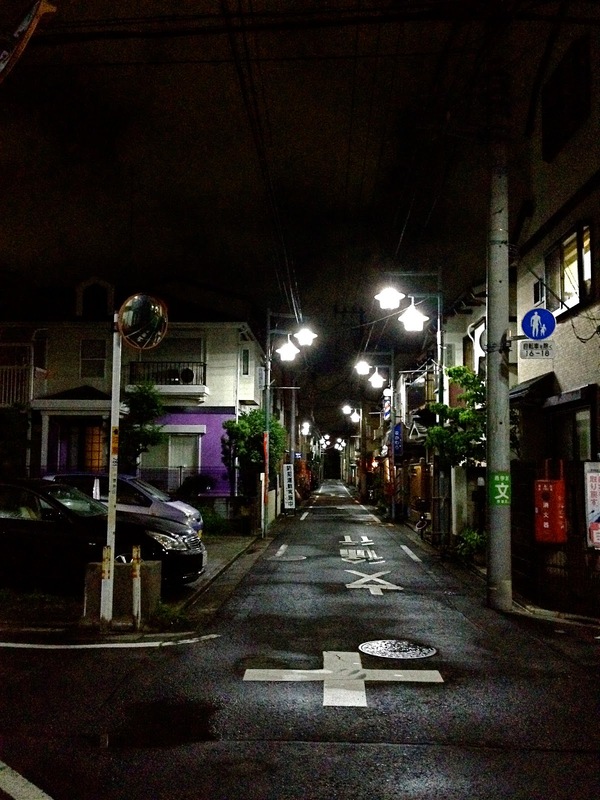 I don't know what it's called or where it is but somewhere near this intersection - Yakuin Mutsukado Street. Ordering blindly from the menu is an interesting experience but know sure if I recommend it! 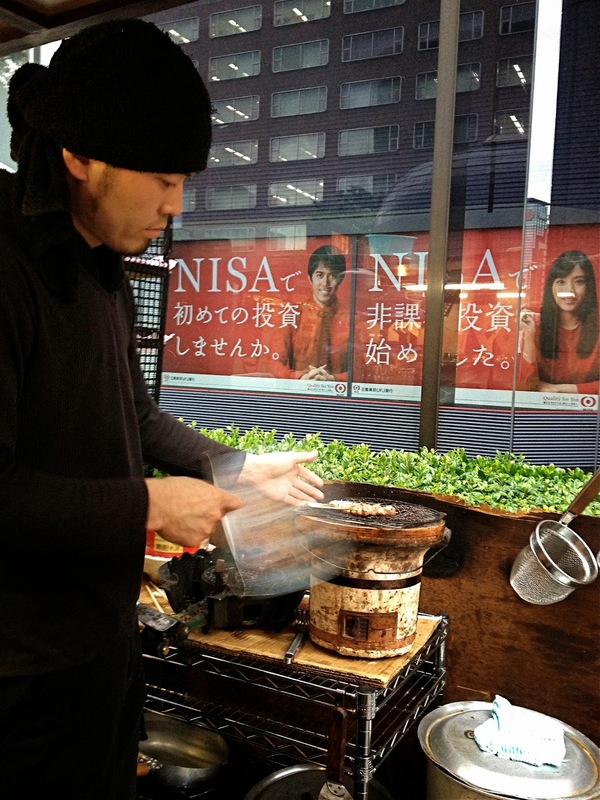 Hehe love travel stories and our pursuit of eating just like the locals do! See you at blogger's picnic!